DESCRIPTION AKA The Hewitson's Olivewing. 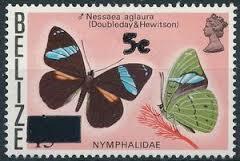 Beautiful cyan markings on this stunning butterfly from the family Nymphalidae. These butterflies are often found along the shady edges of rivers and forest tracks. They are fast flying and easily disturbed. The adults feed on rotten fruit. The verso side of this fabulous butterfly is bright green.